It's no wonder hot air balloons can often be seen gliding through Colorado skies: Between our vaulted mountains, twisting rivers, ochre canyons and golden plains, Colorado’s landscape is tailor-made for a bird’s-eye view. Watch our Colorado ballooning video, shot in Boulder, Snowmass and Pagosa Springs. Find yourself in a thatched basket hundreds of feet up, looking down on the lofty peaks of the Rocky Mountains on a Colorado balloon ride. Or, see the vast expanse of the prairie grasslands as they disappear into the curving, nearly infinite horizon. There are a number of balloon operators across Colorado ready to take visitors skyward, and many of them offer special touches on their rides. Enjoy a champagne toast, classical music and a sit-down breakfast right inside the basket. Flights typically last between one and four hours and leave close to sunrise, when winds are most stable. It's best to dress in layers — departure is during cool hours, but the heat of the balloon (and the sun!) warms you up quickly. Departure locations include Front Range cities like Boulder, Colorado Springs, Denver and Longmont as well as mountain towns like Estes Park, Breckenridge, Vail, Ridgway, Ouray, Aspen and more. Some hot air balloon companies offer the chance to help with the balloon-inflation process, and many also offer a souvenir DVD of your flight. A kaleidoscope of colors takes over the sky at Colorado's many balloon festivals. Get there early to see them all lift off and glow in the morning sun. Many of the balloons stay fully inflated but tethered to the ground so spectators can get up-close views. Imagine rows upon rows of bulbous luminaries, dozens of feet tall, lit up from the glow of flames. 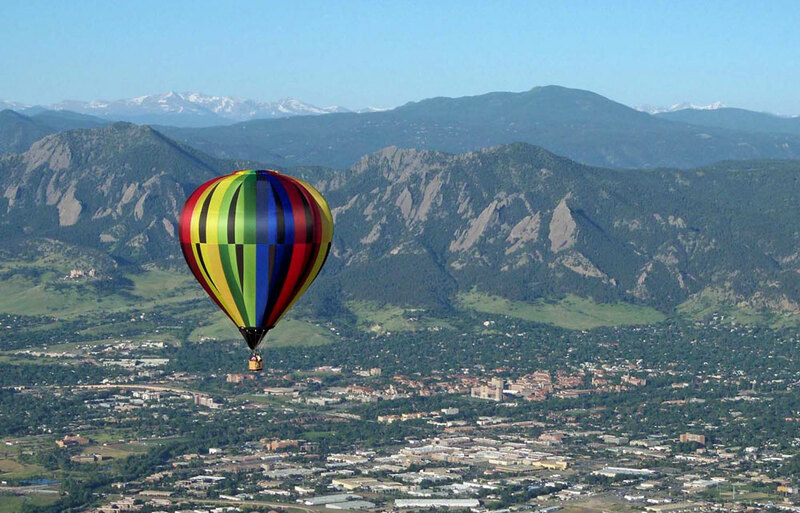 See a video on ballooning in Colorado, shot in Boulder, Snowmass and Pagosa Springs. Photo: Courtesy of Fair Winds Hot Air Balloon Flights.